I pushed against Darcore's blade, but his strength outdid my own. I was soon on the ground. "I wasn't oblivious, I just want to know how this thing chose me instead of the other Chosen Ones! I'm barely a Chosen One myself!" That's when I saw Shylo fly towards Darcore, his claws out, ready to strike. "Shylo, don't!" Cyrus rose up on his hind legs, throwing Drey's kids off. "This isn't your battle, pipsqueaks!" The three went flying off towards the crack in the ground, and tumbled over and down before they could right themselves. I had a moment of frozen silence until they disappeared. "Drake! Sierra! Garreth! NO!" I ran to the edge. Neither Drake nor Garreth would be able to open their wings, and Sierra hadn't mastered flying yet. I turned my head slowly back to Cyrus, both eyes now as deep blood-red as they could go. "You," I hissed through my teeth. Then i vanished from my spot, only to rematerialize right behind him. "Those were my kids!" The sword had vanished and been replaced by diamond claws tipped with black. I raked them down his back, drawing ten bloody gashes. Darcore glanced across at me, and smiled. "Excellent. Well done, Cyrus my friend." I looked over at Drey with worry. Cyrus's wounds were already healing. Drey's attack didn't even do any damage. Cyrus looked over at Darcore and smiled. "Thank you. Now, let's deal with this one first." he sneered glaring at me. "Drey, help me." Cyrus easily leaped over the crack, landing with perfect ease. "I can poison him easily. He might be alive. but he still has on the ring, making him unable to shapeshift." The ring? What ring? Oh, yeah, that one. He was right, I might have gained my powers back, but I still had to get it off. And it was stuck like glue. only the purest of heart could remove it, and Drey didn't qualify. Cyrus lifted one of his claws, and I saw the poison already beginning to flow through it. "Dreyden! Help!" Metal wings appeared out of my back, and i leaped over in the blink of an eye, landing on Cyrus. I dug all my claws into his flesh in a firm gripped, bit the arm raised, seeping my own poison venom in, and pulled hard. Darcore watched this with laughing glee. Cyrus was laughing as well, and that's when I saw it... They were trying to turn Dreyden dark. "Dreyden, stop! Don't you se what they're trying to do?!" 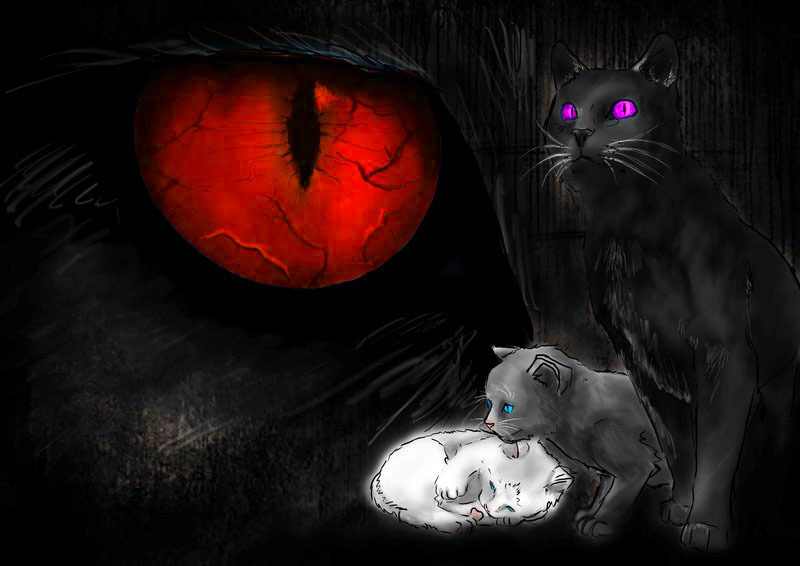 Cyrus suddenly rounded on me, throwing Drey off, and slashed his claws across my chest, reopening the wound, and the poison began to seep in. "Quiet, you insolent brat!" Darcore laughed evilly. "Too late, Sethstone." Then suddenly his body went limp. A dark mist wisped out of his body, and went inside of me. I froze where i was, my face gone blank with shock. Darcore easily got around my new defenses, and found my shattered core. He laughed within my head. I knew it was just a cover. I screwed up. I can't believe i screwed up. He had me right where he wanted me the entire time. He spread his dark soul within my body, attempting to merge with mine. I tried to stand, but the poison was spreading, fast. I was gasping for breath. if someone alive with a pure heart didn't take the ring off, I'd be gone, permanently. At that moment, Kira had risen with the children. Sierra immediately noticed Seth's distress, and ran to him. "Seth! What's wrong?" Drake and Garreth were staring from him to me. I looked up at Sierra with painful eyes. "The poison... spreading... be gone soon..." The scar on my chest was pulsing, and you could hear my rapidly beating heart. "The ring... remove it." I growled, showing them the ring on my hand. "Someone with... a pure heart... can... remove it." Sierra took his hand in hers with tears. "I'll try," she whispered. Please, let him go! 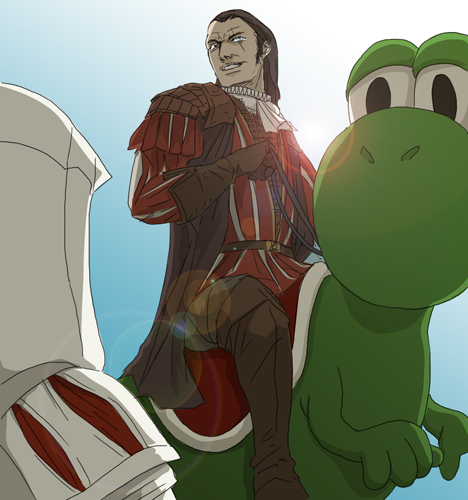 That's when Cyrus entered the fray. However, just as he began to strike, Shylo knocked him out of the way, with another dragon beside him. soren! My true little brother was alive!? "Take care of him. We'll handle this!" Soren yelled, and he bit Cyrus on the throat, making the demon yowl in pain. Something strange was happening to me. The moment Darcore tried to merge with me, there was this pressure, this force, like it was way too crowded inside. Darcore squirmed uncomfortably inside of me. Then suddenly he screamed, and pulled out of me. "What are you?!" A dark energy more intense than anything i had ever felt errupted from inside of me and exploded from my body. I yelled and fell to me knees, panting. The energy began taking a solid shape, and from that shape came the most sinister laugh i had ever heard. I slowly looked up at the sinister laugh. That laugh, that voice... it sunds all too familiar. The darkness formed into...a man. But automatically i knew it was no human. I trying to place where i had seen him before, when i saw his eyes. The same, blood-red eyes i had only moments ago. The same eyes i had seen in my nightmares, and the same level of darkness. Darcore scuttled back in fear. "Wh-who are you?! What are you?!" The demon turned his gaze to the cowering Blood Elf. And smiled, showing a row of sharp white teeth. OOC: Oh. My. God. I just got major chills up my spine. OOC: OMFG, me too! This is so intense! i'm almost out of my seat in excitement! This would make a really good book! "Koschei... You can't be... You mean your soul was inside..." I couldn't finish. I'd heard rumrs of Koschei, about how his soul was hidden inside an egg. But Dreyden's egg? It couldn't be. I then lurched from the pain again. I wsa losing my life. "Sierra, get this dang ring off of me, please." Sierra pulled as hard as she could, and the ring popped off and knocked her back. Darcore seemed to have recovered himself. "Now i remember you. You were at one time the most fearcest creature of time. You were able to rule the world if you so choose." He gave his alurring smile. "It would be much appreciated if you helped us get rid of these losers." Koschei laughed. "Like i would join up with a pair of weaklings." He snapped his fingers, and a lightning bolt shot down from the sky and hit both Cyrus and Darcore. The two vanished with screams. Lightning. His element is electricity. I felt restored, and saw Darcore and Cyrus disappear. "Oh my god... electricity?" I looked at Koschei. "Your element is electricity, just like me and Drey." He laughed. "No, Seth, i believe you mean just like you." I lurched. "What do you mean?" "What? You don't know? Surely you would have sensed it by now. Ah, no matter. You shall learn, Dreyden. Audriant's heir, why don't you explain how your grandmother attempted to get rid of me? I'd like to hear her version of it." I looked over to her. "Kira?" She looked fearful. "My grandmother was the fabled lady in the human tales of Koschei the deathless. But it was she who went to battle with him. The story goes that he could not be killed because he had sealed his soul outside his body inside an egg. Grandma said she destroyed that egg, that that was the only way he could be stopped." "Yes, while that is true, even she could not get rid of me," he mused. "Moments before she had destroyed that egg, I detatched my soul and sent it somewhere else." Then he laughed. "Hehehe. I can see it in your thoughts. You're all desperately trying to think of where this new place might be so as to destroy it. Well, I'll go ahead and tell you; It's right here, in this very room." "What are you talking about, Koschei?" Kira demanded. He chuckled. "I'll give you a hint. I hid my soul inside a new egg, one no one would ever think of looking. I hid it inside a human's egg. But i never would have imagined that egg to hatch into a DragonLord." I'm sure that if I was drinking something, I would have choked and tried to spit it out. "Whoa, whoa, whoa, just a minute. I have over a billion questions here. First of all, what do you mean by just me with the element thing? And second of all, you hid your freakin' soul inside Dreyden's egg?!" My heart stopped for a full second. "Wh-wh-what?!" Koschei merely laughed and ignored Seth. "How does it feel, Drey, to know your soul isn't even yours?" Koschei laughed loudly, sending more chills down my spine. "Oh, you don't, do you? Then perhaps this will convince you." A sword materialized in his hand and he pludge it...through his own chest. I screamed from agonizing pain as he laughed, pulling it back out. I was speechless, and I bet you my mouth was open. "What? Why? Why did you chose him?!" I yelled, my anger beginning to burn. "Fool, i didn't choose him. How was i to know the egg would even hatch? But it worked to my advantage; my soul is protected by one of the mightest creatures of time. "Fight me if you dare, i cannot be destoyed." I fell to my knees, the pain slowly lessoning. It...it really felt like i had been stabbed through the heart. The feeling shocked me beyond thinking. My soul...am i really Dreyden Istalri? Or am i Koschei? How can i know? I looked up, Kira's voice bringing me back. She had a confident expression. "You are not him. His soul may be inside of you, but you are still you!" "That's exactly what I was about to say! Don't listen to what Koschei says! He's just trying to manipulate you, like Darcore!" They're right. His may be inside of me, but i have a soul of my own! But...how do we defeat him? He laughed again. "Please, Dreyden. I know you better than you know yourself. You could never bring yourself about to kill yourself. As for you," he directed his attention towards Kira. "It's time i vanquished the blood line of Audriant Dimonsque once and for all!" He thrust his blade towards her. A new pain errupted inside of my chest, but this time, Koschei screamed. Hot liquid poored down my back; blood had splattered onto Kira. I coughed, spitting up blood. Koschei's sword hilt pertruded from my chest, the blade tip sticking out from my back. OOC: oh my god my heart his pounded so hard it literally hurts. 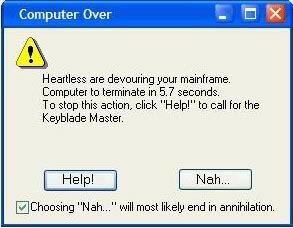 OOC: Crap! Now i'm gonna burst into tears! "Drey, what are you ding?!" I screamed, standing in front of Kira. If Koschei was going to attack again, he'd have to take me down to Hell with him first.